From Windows Vista and Windows 7, 8, 10 you can enable or disable the Windows Explorer file grouping in Q-Dir ! To disable / enable the file grouping in Q-Dir by right-clicking on the appropriate explorer window and then selecting the menu item Group by > (None) (... see Image-1 Arrow-1)! Or a grouping type that you need now. Use the address bar to navigate to a different folder or library or to go back to a previous one. Use the column headings to change how the files in the file list are organized. For example, you can click the left side of a column heading to change the order the files and folders are displayed in, or you can click the right side to filter the files in different ways. (Note that column headings are available only in Details view. ► How can I block Q-Dir to open *.zip, *.rar *.cab folder? This is where the contents of the current folder or library are displayed. If you type in the search box to find a file, only the files that match your current view (including files in subfolders) will appear. 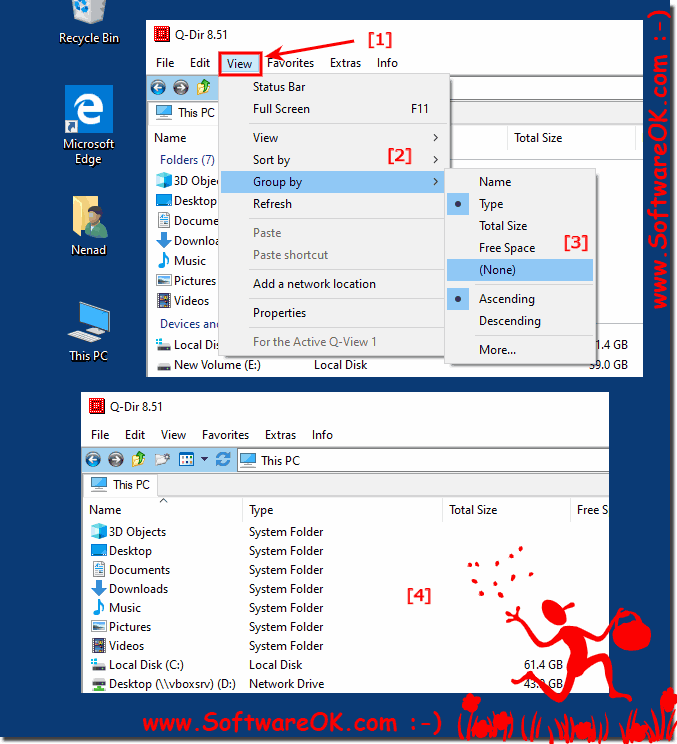 (Image-1) Disable or enable the Windows Explorer file grouping in Q-Dir! Q-DIR - FAQ-95: Disable the Explorer List View file grouping in the File-Manager! I have Q-Dir set to show three different panes. The lower right pane always shows the line called "Unspecified" (see attached screenshot) whereas the other two do not. I have not changes the config settings in a long time, but this started showing up after a recent version upgrade.